Haya Maraka lives by her own rules. 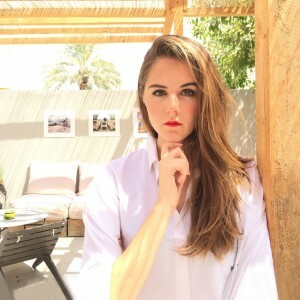 Born in Texas, raised in Saudi Arabia and Dubai (with brief stints in London and Switzerland), and now based in New York, the luxury consultant has developed a unique set of personal mottos along the way. “I have manners, and I have no manners at the same time, so Modes & Manners is a modern etiquette book without the etiquette,” says Maraka of her first publishing venture, sitting beneath the gilded, chandelier-lined ceilings of The Plaza Hotel in New York City. Indeed, Maraka, who has consulted for brands such as Dior and Bergdorf Goodman in the past, is a lady in the most classic sense of the word. She’s urbane, gracious, and has a highly distinguished taste level, whether it’s the crystal-embellished satin and shearling Miu Miu mules she’s wearing on the day of our shoot or her date with the New York City Ballet the evening before this interview. And yet, anyone who has met Maraka knows it doesn’t take long to see that she’s not one to shy away from voicing her opinions. I think the word ‘manners’ is really dying out. I mean, are they even going to teach kids manners in the future? They might teach them how to use an iPad, but not to say please and thank you. In addition to the 99 percent probability of spotting Maraka somewhere within The Plaza’s walls, you’re likely to find her dog Cleo accompanying her, who seems just as comfortable at the regal property. “I was actually scared of dogs my entire life but then I found out that Azzedine Alaïa has a million dogs. I thought to myself, ‘If Alaïa, who is my absolute icon in life, has so many dogs, I really need to start liking dogs.’” And so goes their love story. “When I went to see Cleo, he was a puppy and everyone was bullying him. He was cross-eyed, and the ugliest puppy there. And everyone kept asking if I was sure that I wanted this dog. And I said, ‘This is the one I want.’ As soon as I picked him up, I fell in love with him. Everyone was calling him ‘Kris Kross’ for a while. I called him Cleopatrick because I was Cleopatra in my past life and he was probably my servant. But now I’m his servant,” she jokes, with all the effortless charm of a young woman who is wise enough to know that having the right personality is just as important as having the right pair of Miu Mius.